A view of what Buildings F (left) and E would look like at 385 Pleasant St. after proposed changes to the plans. The developers of the mixed-use property at the corner of Pleasant Street and Rosedale Road, wants to reduce the height of one building, and move the residential units to another building. 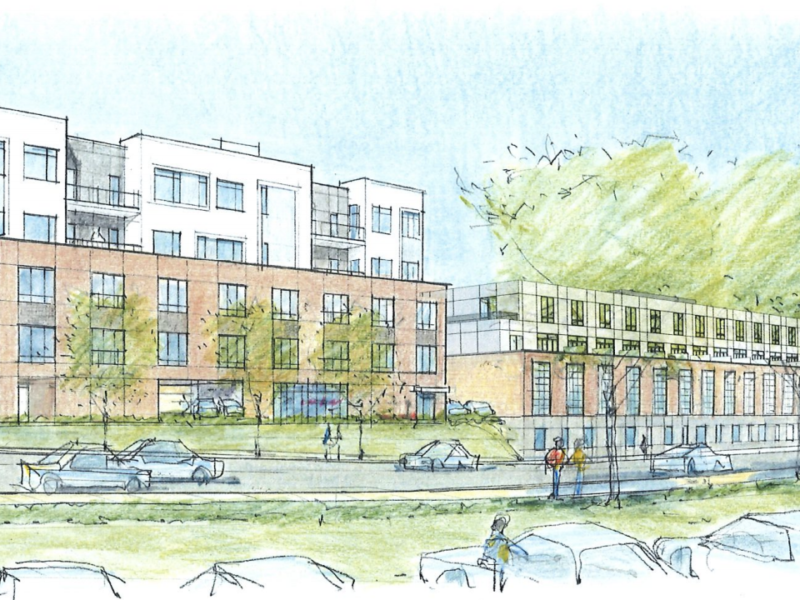 The project at 385 Pleasant Street includes four buildings along Pleasant Street heading toward Bridge Street, with three all-residential buildings and one with commercial on the bottom and housing units on top. A request has been submitted to the Planning Board to make changes to the plans that were approved in March 2018. Neighbors of the project at 71 Salisbury Road say the excavation has impacted their properties, and they did not receive notice. The major excavation for a single-family home on Salisbury Road has drawn the ire of neighbors, and now the District Town Councilor, who questions how the work was allowed by Town officials. Last week, residents alerted the Town Council to the work being done at 71 Salisbury Road, including a major excavation of bedrock which took several days and damaged the roots of trees and shrubs on neighboring properties. The property was purchased in August 2015 by Eamon Fee, one of the developers of the parcel. The Town issued a building permit in August 2018 for a single-family house, which is allowed “by right,” so the project would not have to get approval from the Zoning Board of Appeals. My wife and I bought a small house in Watertown 8 years ago and we have begun our family there. We love being in Watertown and intend to continue as a part of the community we have found here. In the past week a developer has begun construction on the lot abutting ours. They are constructing a spec house in place of the previous house which was razed 3 years ago when they acquired the land. This new house is to be put on the market as soon as it is completed. The developer delayed construction these years as they sought a solution to squeeze a two-family structure on the small lot but apparently decided that pursuing a special permit would invite too much push back. Now they have pulled a permit for construction ‘by right’ and as a first step have undertaken blasting away the large rock ledge upon which the old house was constructed. They have continued this excavation into a second week using two earth moving machines, one to blast the rock and one to scoop it into a line of waiting dump trucks, right up to the property lines on all sides. The grade has been lowered significantly across the entire parcel such that at my property line there is now a shear face of exposed soil and bedrock where the incline which used to continue from our property into theirs has been blasted away. As a result two mature maple trees on our property have had their roots exposed and torn away. No attempt whatsoever was made to protect these trees even though doing so would pose no impediment to the construction of the house which they have permitted. Only willful disregard for the impact on neighbors property and desire to remove as much of the existing topography as possible has led to the damaging of these trees. Boylston Properties and The Wilder Companies will hold a Community Meeting to review and update the community on the status of Building G located within Arsenal Yards. The purpose of this meeting will be to present and discuss a change in use for the building from Residential to Office/Lab. Building G, as proposed would contain approximately 140,000 sq. ft. of Lab space (a decrease of approximately 48,000 gross sq. SQZ Biotech recently completed a $72 million Series C and expanded a clinical and commercial development collaboration with Roche. Neighbors on the back side of 73-75 Morse Street worry that having a two story garage right near their property line will hurt the value of their homes. The Watertown Zoning Board of Appeals will hear the appeal of neighbors about the two-story garage that is being built on Morse Street on the Southside of Watertown. The latest ZBA agenda includes the 73-75 Morse St. case. On Feb.
A view of Arsenal Street from inside Building E, one of the historic structures being redeveloped as part of the Arsenal Yards Project. Boylston Properties seeks a tenant for this “prime spot.” As the new Arsenal Yards begins to take shape, developers have changed plans for the last building in the project, shifting the 130-foot Building G from condos to a lab and office building. 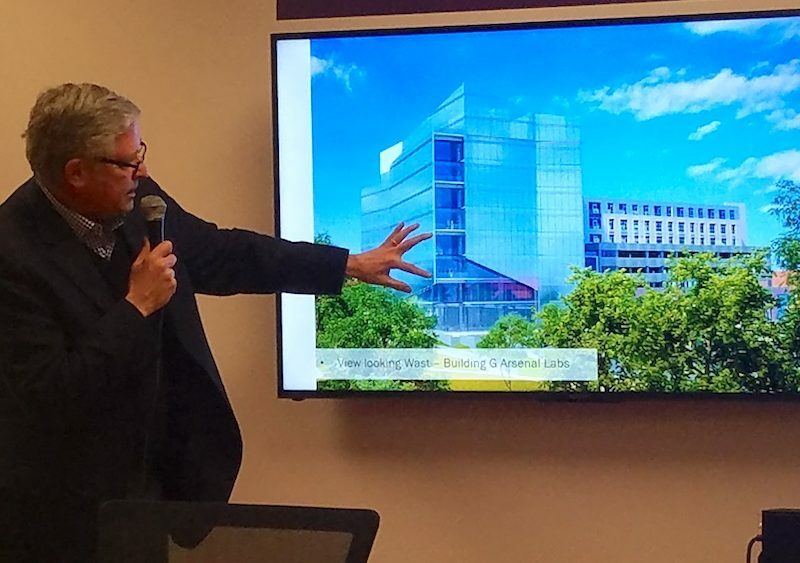 In December, Boylston Properties withdrew a request to the Town to allow them to make Building G a 197 foot apartment tower, 67 feet higher than allowed by Watertown’s zoning rules. They will soon submit plans for a new building that they hope to lease to biotech companies. A rendering of what a 197-foot-tall residential tower could look like at Arsenal Yards. Developers would have needed a zoning change to allow it to be more than 130 feet tall. The requested zoning amendment, however, has been withdrawn. Boylston Properties, the developer of Arsenal Yards, has withdrawn its request to build a tower taller than is currently allowed by Watertown’s zoning rules. Developers had submitted a request to the Town to increase allowable height in the Regional Mixed Use District (RMUD) — where the mall is located — from 130 feet to 197 feet. Boylston Properties (BP) is seeking a zoning change at Arsenal Yards. What the published agenda IV. 485 Arsenal Street (click here) amendment fails to disclose is that while BP is again pushing for a height increase to 197 feet at Building G, they are also asking for 80 percent of that height for any additional buildings on their site on the south side of Arsenal Street. They want to create their own separate zone within the RMUD. If approved, those buildings could go to 157.6 feet.